This is a sample of the type of communication that is going on here. Krishna is sending more and more devotees to me. I feel I have your blessings and so the blessings of the Lord. I was working yesterday and today as well.. so time tied. It's relevant to our exchanges on the topic of our origin and realization. "Today we will anticipate the time when dreams of sin and guilt are gone, and we have reached the holy peace we never left. Merely a tiny instant has elapsed between eternity and timelessness. So brief the interval there was no lapse in continuity, nor break in thoughts which are forever unified as one. Nothing has ever happened to disturb the peace of God the Father and the Son. This we accept as wholly true today." " We thank You, Father, that we cannot lose the memory of You and of Your Love. We recognize our safety, and give thanks for all the gifts You have bestowed on us, for all the loving help we have received, for Your eternal patience, and the Word which You have given us that we are saved." As we understand from the history of the Vedas from time to time impersonal concepts are introduced for one reason or another. Those who are attracted to this impersonal aspect miss the mark. To actually experience an intimate loving relationship with the Lord impersonalism will be left behind. The hallmark of impersonalism is fancy word jugglery and all sorts of nonsensical rationalizations and faulty logic that really don't make any sense, even common sense. The devotees become entangled in the word jugglery and argue. 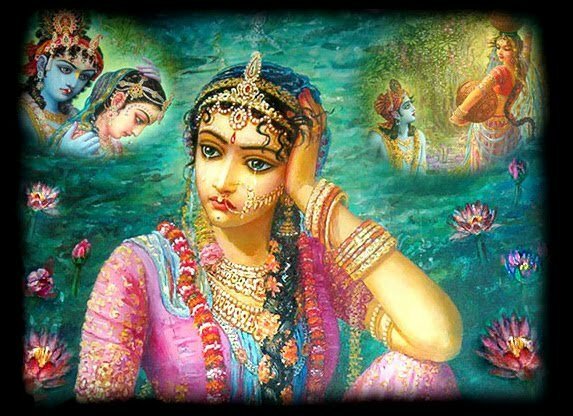 What to speak of leaving impersonalism behind, even awe and reverence will be discarded and will be seen as an impediment to intimate loving exchanges with Radha and Krishna and the other residents of Vraja. Krishna empowers in real time those who can help us. It is not just book-knowledge. This is our struggle and I am seeing it play out at ___________'s house. This is living Chaitanya Lila and it is a lot of fun.